The Rongai route is a remote, quiet route on Kilimanjaro. 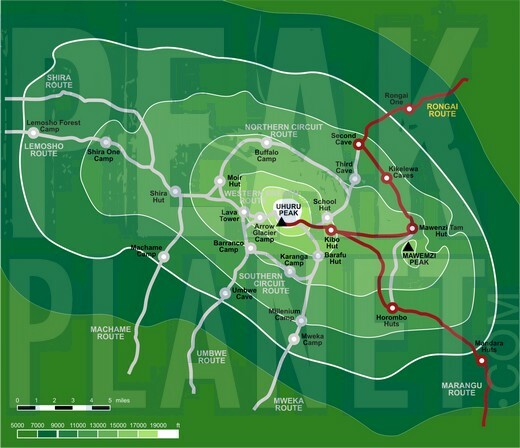 The Rongai route is the only route that begins on the northern side of the mountain, near the Kenyan border. The route has a gradual ascent until the summit attempt from Kibo Hut. The descent is by Marangu. Because few climbers use this route, there is a real chance of seeing wildlife on the lower slopes. The Rongai route is a good choice for those who want a more secluded hike or those who opt for an easier trek. The Rongai route measures 40 miles (65 km) in distance and takes 6-7 days total. We take a ride to Marangu to complete the necessary registration formalities, before transferring by Land Rover to Rongai. The climb begins from Nale Moru (6,400 ft) on a small path that winds through fields of maize and potatoes before entering a pine forest. The track then starts to climb consistently, but gently through an attractive forest that shelters a variety of wildlife, including the Colobus monkey. These monkeys are black with a long ‘cape’ of white hair and a flowing white tail. The forest begins to thin out at the edge of the moorland zone. Then, we take in the expansive views over the Kenyan plains as we arrive at our first campsite at Rongai One (8,500 ft). The morning walk is a steady ascent up to the Second Cave (11,300 ft) with superb views of Kibo and the Eastern Icefields on the crater rim. After lunch, we leave the main trail and strike out and head southeast across the moorland on a smaller path towards the jagged peaks of Mawenzi. Our campsite is in a sheltered valley, decorated with giant senecios nearKikelewa Caves (11,800 ft). A short but steep climb is rewarded by superb all-around views and a tangible sense of wilderness. We leave vegetation behind shortly before reaching the next camp at Mawenzi Tarn (14,200 ft), spectacularly situated in a cirque directly beneath the towering spires of Mawenzi. The afternoon will be free to rest or explore the surrounding area as an aid to acclimatization. We cross the lunar desert of the saddle between Mawenzi and Kibo to reach Kibo Hut(15,400 ft) at the bottom of the crater wall. The remainder of the day is spent resting in preparation for an early morning final ascent. To climb Kilimanjaro on the Rongai route.